The Adventures of an Intrepid Reader: Remember when I said it was hot a couple of weeks ago? Remember when I said it was hot a couple of weeks ago? In all the time I have lived in Melbourne, I don't remember it ever being this hot. In fact, I don't recall it ever being this hot when I lived in Adelaide either. Updated to say: How right am I! Apparently this has been the hottest temperature ever recorded in an Australian capital centre. No wonder I don't remember it being this hot in Adelaide. I have know idea if that is the hottest it has been all day. I haven't been checking. For those of you who don't work in celcius, that is 116.4F. Edited to Add: According to the news, this is the hottest day in Melbourne since records began and ended up being 47.9 degrees near me. Edited again: There are a number of fires burning out of control, and a number of houses burnt out across the state. Please keep the firefighters and people affected in your thoughts and prayers. The one thing I can't cope with is excessive heat. Here in the UK it rarely goes over 30C - luckily. I don't know what I'd do if it hit 46C. I feel so sorry for you and am sending good vibes for it to cool down very soon! The cool change has just come through and the temperature just dropped by 20 degrees in about an hour! Now it is a case of trying to get the house cooler in time to sleep tonight. Oh my gosh about the fires! We live in such a humid climate, this doesn't happen. Fires scare me. Oh my Marg, that is getting crazy. When we get above 30C here we're all complaining how hot it is; I can not imagine 47C at all! Marg, you stay safe. I know when it gets really hot in British Columbia especially, wildfires rage out of control. My prayers are with you that you stay safe and the same to all out there. I hope this heat wave passes over already---it's scary. I certainly see now why my snow looks so good to you. We heard about the fires this morning and that some people have died. I'm so sorry. 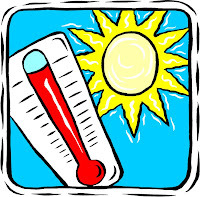 We've been hearing about the heat too - my husband was watching the Australian Open - its' incredible that people are even walking around in that heat! Here's hoping it cools down to bearable temperatures, and the fires are contained SOON. Susan, there were people out jogging in 44C heat yesterday. Idiots! The temps have come down but the wind is still a factor, and because everything is so dry it is just perfect fire conditions. In January we only had 0.5mm rain, so everywhere is dry. Dar, fortunately there are no fires close to us, but I do know a lot of people who are providing support to firefighters. J Kaye, we don't have to worry too much about things like earthquakes and blizzards etc, but fires are something that we do have to worry about. Marg, I'm packing my bags! I'm coming for a visit. ;) I'm so tired of cold and snow, that I'm ready for a little change. But I can understand concerns over the heat. Yep! Some snow sounds good right about now, but I am not sure I could cope with the extreme cold either because we dont have to worry about that here in winter. If it is only 10C we think it is freezing. You're all in my thoughts and concerns. I've been astounded by the reports of the temperatures in Melbourne. I don't think it ever got hotter than about 42C when we lived there and we found that unbearable. I can't imagine how you're all coping with these hot hot days. I have to admit that when Dave told me it was 47C, I didn't believe him at first. It just seemed to hot to be possible, even for Melbourne. I'm thinking of you and everyone else. I promise not to complain if it gets close to 30C here today like the forecasters are suggesting. Wow, 46 degrees! That's very hot! What's causing the high temperature? I've read in the papers about the fires there. Do take care. Oh my! That sounds very hot indeed! I hope the weather will get better! Hang in there!